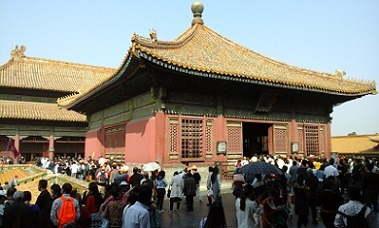 The Forbidden City is one of the highlights in Beijing and a “must-have-seen-attraction”. The location is in the heart of the city. 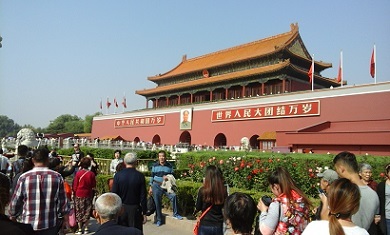 The main gate is in front of Tiananmen Square. In the past it was the imperial palace during the Ming and Qing dynasties. 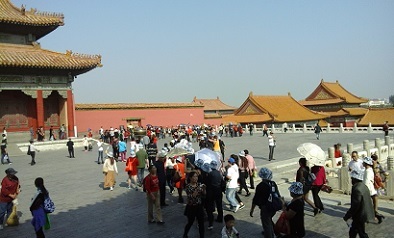 That’s why The Forbidden City is also called “the Imperial Palace Museum”. Construction of the palace complex started in 1407, the 5th year of the Yongle reign of the third emperor of the Ming dynasty, and was completed 14 years later in 1420. The complex is huge: it covers 72 hectares and and has 9,999 rooms. 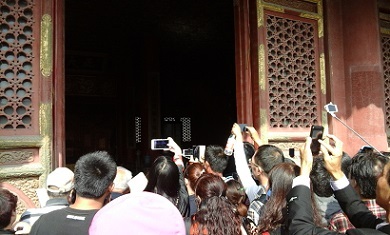 Not all rooms and halls are public or can be seen: there are renovation works busy in the Forbidden City since years. 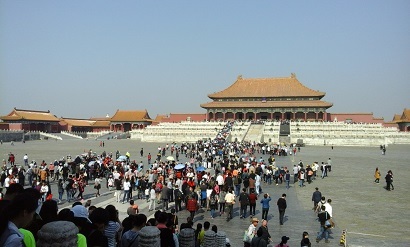 The main entrance to the Forbidden City is at Tian’anmen Square. The ticket windows are inside. Don’t forget to take your ID-card! You have to show it when you buy tickets. The admission is 60 Yuan in high season (April-Octobre). In low-season it’s 40 Yuan. The metro entrance of Tiananmen Square is close to the Forbidden City. Opening hours of the palace is 08.30 to 17.00 (April 16 – October 15). Around and inside the palace are vendors with drinks and tourist items. If you don’t want to go on your own: many hotels offer city tour packages with a pick-up service from your hotel. We visited the palace in the Golden Week in 2015 (first week of october). That time is a national holiday and it’s then very busy in Beijing at tourist spots.